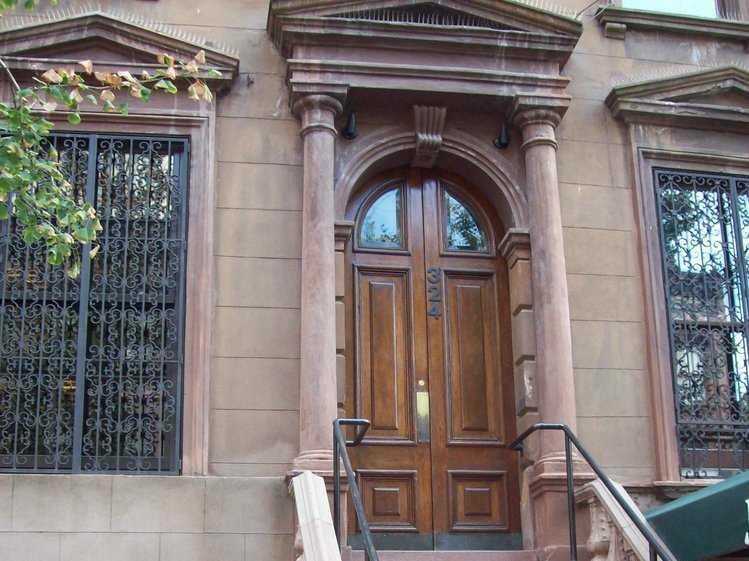 Yelp/Michael B.Bar Centrale is hidden inside a brownstone apartment. 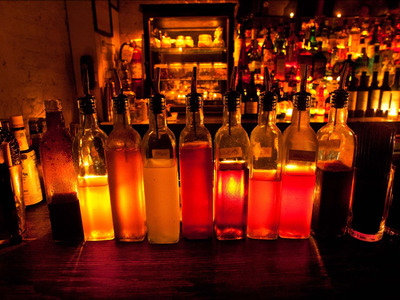 Hidden bars have been popular in New York City since the time of Prohibition. Today, drinking is legal, but New Yorkers still love these speakeasies for their vintage decor, secret entrances, and cocktails made with classic ingredients. From Dutch Kills in Long Island City to Attaboy on the Lower East Side, here are 30 of the best hidden bars in New York City. 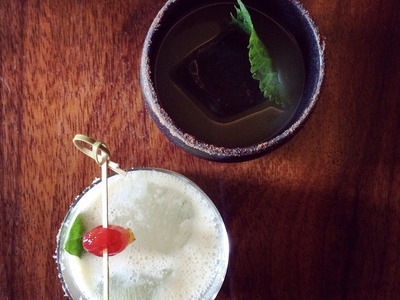 At Attaboy, just tell them what type of liquor you like to get a one-of-a-kind mix. Opened by two longtime Milk & Honey bartenders, Attaboy is an industrial-style, no-fuss bar where you don't even get a drink menu. 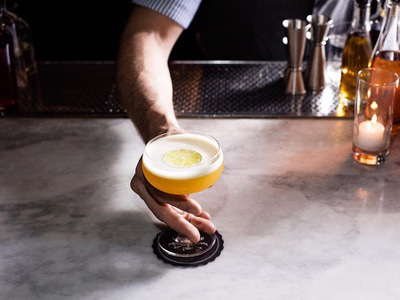 Instead, the bartender will ask you what types of drinks you usually like, so they can get a sense of your preference in flavours before whipping up your custom selection. To spot the bar, look for a neon 'A' on its window. 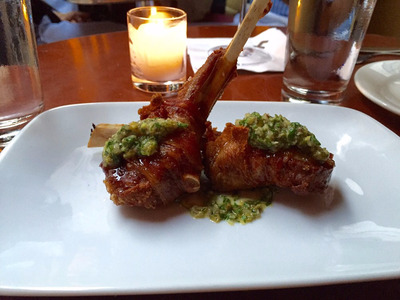 Bar Centrale is hidden inside a brownstone. 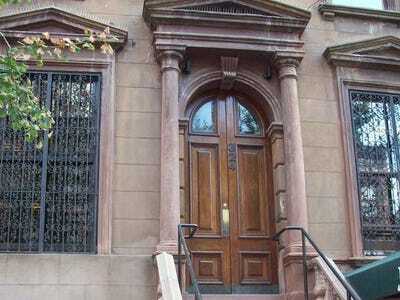 You might walk right past Bar Centrale, considering that it looks just like any other brownstone from the outside. Inside, however, is a cool bar. 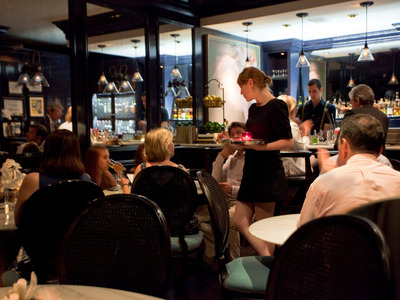 If you want a table, you'll need to make a reservation, but try to pop in after Broadway shows, as you'll sometimes be able to spot some stars at the bar. At 67 Orange Street, you can get lobster mac and cheese with your cocktail. 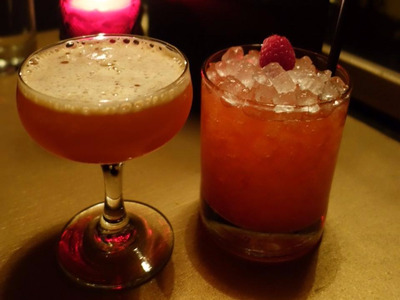 Behind the thick curtains lining the windows of 67 Orange Street is an intimate Harlem speakeasy, where you can get crafty cocktails with everything from gin and cognac to whiskey and champagne. The lobster mac and cheese and fried-chicken sliders complement the tasty drinks. B Flat has live jazz and a decent happy hour. To find B Flat, keep your eyes out for a black door with 277 on it. Once you go down the stairs, you'll find live jazz performances if it's a Monday or Wednesday, American-Japanese dishes like the teriyaki burger, and a wide selection of whiskeys. Raines Law Room's waiters come to your table when you pull a lamp string. From West 17th Street you'll see an unmarked stairwell. Head down and ring the doorbell, where a host will take you into the underground cosy den filled with curtained-off couches, soft music from the 1920s, and lamp strings you pull to have your waiter approach your table and take your order. Fig. 19 sits behind an art gallery. The entrance to The Loge Gallery (Fig. 19 is inside). Fig. 19 sits in the back of the brightly-lit art gallery Envoy Enterprises. The doorway is plain and wouldn't catch your eye, but when you get inside you'll see two large, glittering chandeliers draped over the bar. Fresh drink ingredients include mint, rose, ginger, tarragon, and lavender. The Back Room was an original speakeasy during Prohibition. Keep your eyes out for a sign that reads 'Lower East Side Toy Company.' 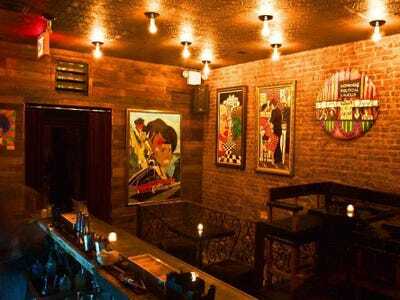 Then enter through the gate, and go down a flight of steps to get to this Lower East Side speakeasy. 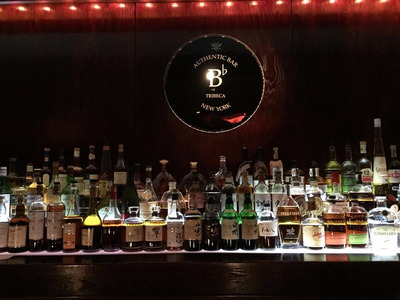 An original speakeasy that operated during Prohibition, the Back Room maintains an old-time feel, serving your cocktails in teacups and bottles of beers in paper bags. Its hidden entrance is the same one that was used more than 80 years ago. There's even another room hidden within the bar, behind a trick bookcase. 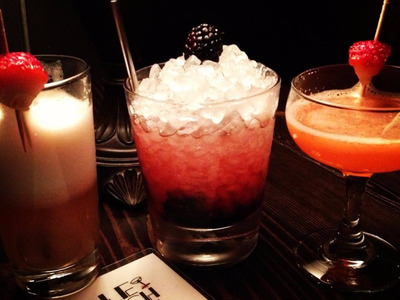 Bathtub Gin is nestled inside the Stone Street Coffee Company. 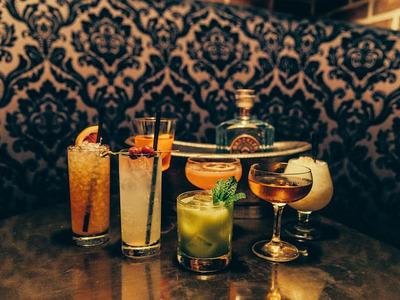 Located behind a door in the Stone Street Coffee Company, Bathtub Gin is a swanky speakeasy that focuses on gin-based cocktails. Small plates are paired with cocktails that include gin and a variety of fres fruits and infusions. 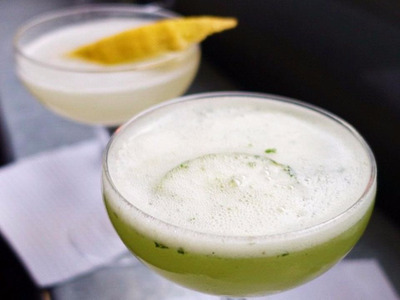 At PDT, you can sip on your cocktails while munching on a signature Crif Dogs hot dog. 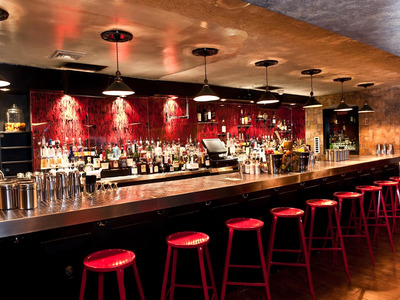 PDT (Please Don't Tell) is often named one of the best bars in the city. Located inside Crif Dogs, you can access PDT by stepping into the vintage telephone booth in the restaurant, ringing the buzzer, and waiting for the hostess to open up the other side of the phone booth. Since it's a very cosy and small speakeasy, it's best to make a reservation, but once you're inside you'll get intricate cocktails and a special menu of Crif Dogs hot dogs. Blind Barber offers haircuts by day and cocktails by night. At the Blind Barber, you can get a haircut during the day and a sophisticated cocktail at night. They bring in DJs to host dance parties, and the music is everything from '80s throwbacks to modern hits. Dear Irving has four rooms decorated to represent different time periods. When you get to this address, you'll see a flight of unmarked stairs. Take them up to Dear Irving, which has stunning decor in four rooms representing different historical eras. There's the JFK room, with '60s-style leather seats; the F. Scott Fitzgerald room, with glittering crystal drapes; the Abraham Lincoln room, with velvet couches and dark wood; and the Marie Antoinette room, adorned with French chandeliers, paintings, and sofas. Every table has a buzzer you can use to call over your waiter, and you can even reserve mixology classes with its sister bar, the Raines Law Room. 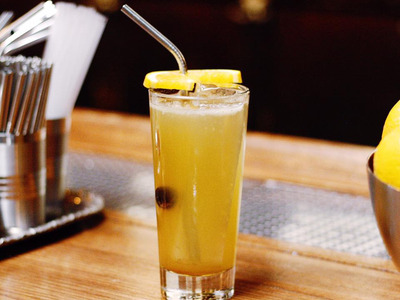 Death & Co. makes strong drinks with playful twists. Wooden panels replace windows at 'Death & Co.,' which you can spot by the name written in metal letters on 6th Street. They work on a first-come, first-served basis, so the line to get in can get long. Plan ahead. It's easy to walk past this Long Island City bar because the dark wooden exterior is only marked by a 'BAR' sign. Head here for cocktails that cost around $11 (a couple of dollars cheaper than those in the city), and live jazz shows. Angel's Share is hidden inside a Japanese restaurant. 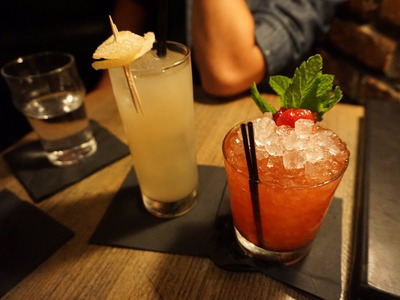 Open since the mid-1990s, Angel's Share is one of the coziest speakeasies in the city, in part because no parties greater than four can get in. It's hidden behind a door inside the Japanese eatery Village Yokocho, and the bartender makes a mean whiskey cocktail. Employees Only has a tarot card reader who also does palm readings. The bright 'psychic' sign that illuminates Employees Only isn't just for show. 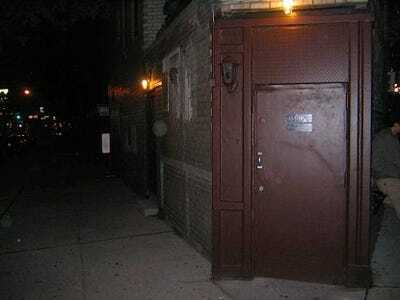 There is a psychic inside this small speakeasy who will tell your future for $25. 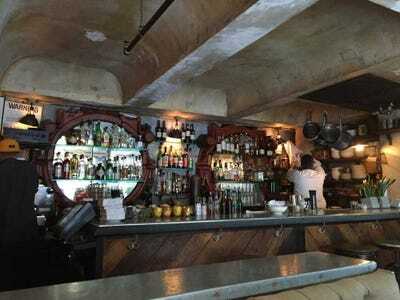 Employees Only is known as a popular late-night spot thanks to its eclectic food and drink choices, like its bone marrow poppers and its Mata Hari drink, which combines cognac, chai-flavored vermouth, and pomegranate flavours. Look for a huge mural of a boxer to find Featherweight's entrance. Williamsburg's Featherweight pays homage to its name with a large mural of a boxer on Graham Avenue -- a signal that you've arrived at the bar. It's cash-only, but cocktails are only $11. Plus, if you can't figure out what you'd like to drink, the bartenders can whip up something special just for you. Brooklyn Social used to be an exclusive Italian men's social club. Brooklyn Social used to be open just to a select few, but today the bar offers all guests cocktails and a traditional Italian panini. It can be tough to miss, considering the entrance is an all-black facade with tiny slits for windows, but once you're inside, you won't regret sipping on one of their strong and flavorful drinks. Little Branch has an old stand-up piano that accompanies jazz performances. You can spot out this bar, whose entrance is a nondescript maroon door, by the bouncer sitting outside. Downstairs, you'll find bartenders in suspenders, mustard-coloured walls, low ceilings, and an old stand-up piano that accompanies jazz performances Sundays through Thursdays. Tell the bartender your favourite type of alcohol, and he'll hand over a massive list of cocktails that use it. Middle Branch has two floors of fun. This airy, two-story bar serves up signature classic cocktails, snacks, and live jazz. 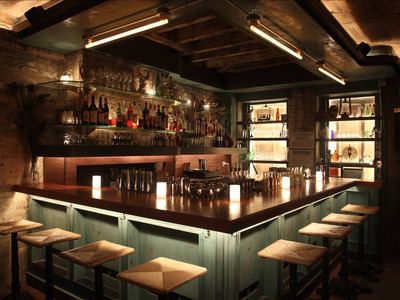 It's spacious for a speakeasy, with room for 25 upstairs and standing room downstairs for around 30 people. The former antique store is in an unmarked townhouse, so once you get to the door, head down the stairs and you'll find the bouncer. Nitecap is in the basement under the restaurant Schapiro's. Nitecap is from the creators of Death & Co. It's located below Schapiro's, down a set of stairs and behind a velvet curtain. 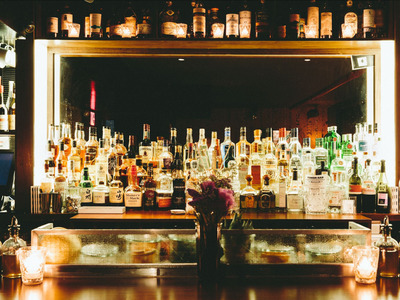 The intimate, dark bar offers over 20 pages of drinks, all of which pack a punch. 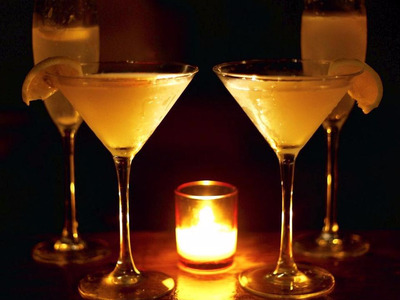 The Manderley Bar is part of Sleep No More, but you don't need show tickets to attend. 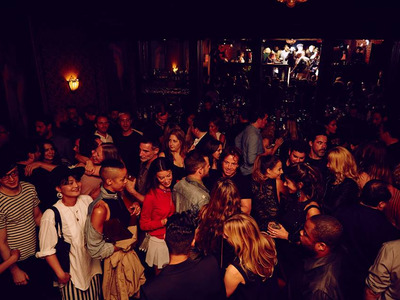 The Manderley Bar is located at the McKittrick Hotel, home to the interactive performance Sleep No More. You can still enjoy a cocktail here without attending the evening's main performance, though. Red velvet interiors, absinthe, and actors who perform old-school tunes make you feel like you've been transported to the 1920s. 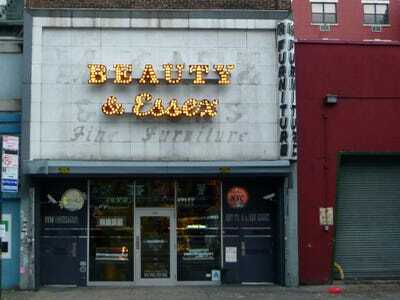 Beauty & Essex has a fully-functioning pawn shop as its entrance. ‘BEAUTY & Essex’ by Jessica Spengler, © 2016, Flickr, licensed under Creative Commons Attribution 2.0 License. At Beauty & Essex, the entrance is a fully-functioning pawn shop where you can buy everything from earrings to antique decor. Once you head inside, there's a grand room with a dining area, a massive chandelier, and free champagne in the ladies' room. 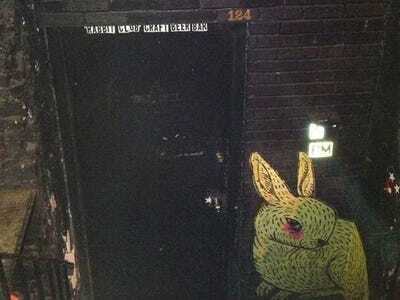 124 Old Rabbit Club has a rabbit painted on its entrance. Amidst the hustle and bustle of MacDougal Street, 124 Old Rabbit Club offers a dimly-lit wonderland for beer lovers. The bar hosts over 70 types of beers, mostly European. Look out for the rabbit painted on the brick wall next to its entrance, press the buzzer, and head down the rabbit hole for a few pints. Mulberry Project's entrance is just a bright red door. This bar is hidden behind a red door below an Italian restaurant. 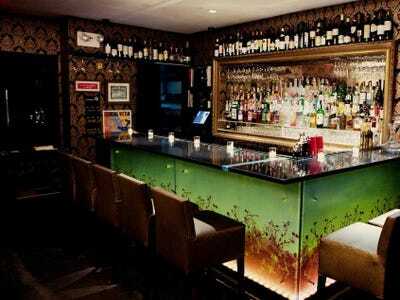 The bar serves bespoke cocktails, so there's no drink list. Simply tell them what kind of drink you want, and they will make it for you. They also have a patio that's perfect for the summer, and a chalkboard that lists the daily fresh fruits they can incorporate into your drinks. Auction House is a favourite for couples. Auction House has a romantic scene, thanks to its antique velvet furniture, crystal chandeliers, and large Renaissance paintings. Plus, the room is dimly-lit and rarely overcrowded. Note that you won't get in if you're under 25. Larry Lawrence has a see-through balcony. To get to Larry Lawrence, you'll have to go through two heavy doors and down a hallway before entering the wood-paneled lounge. Brick, custom furniture, and its see-through outdoor balcony combine to offer a unique space. Lantern's Keep is tucked away inside the Iroquois Hotel. Lantern's Keep is a small, inconspicuous bar hidden inside the Iroquois Hotel. A reservation is definitely recommended, since it does not seat many people. 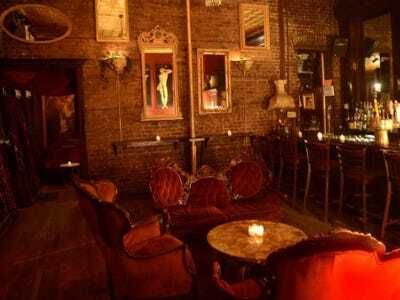 Inside, the bar has a romantic atmosphere with dark walls, marbled tables, and candles. Try their Iroquois #2 cocktail, made with cognac, pineapple, lemon, angostura bitters, and yellow chartreuse. Smith and Mills' bathroom is made from an old European elevator cage. 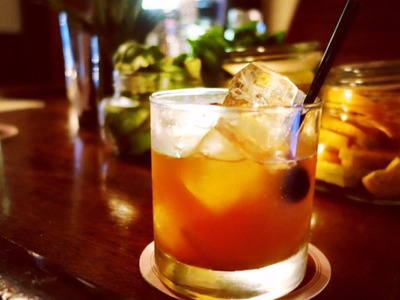 This old horse stable-turned-speakeasy has large booth seating, a bathroom that used to be a European elevator cage, and classic cocktails with ingredients like egg whites, fresh juices, muddled fruits and vegetables, and bitters. It's cash-only, so make sure you hit up the ATM beforehand. Est. 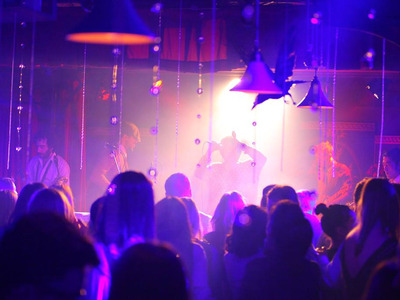 1986 is one of Koreatown's best-kept secrets. Located on the second floor of the Hotel Stanford, the bar is known for its extensive wine selection. 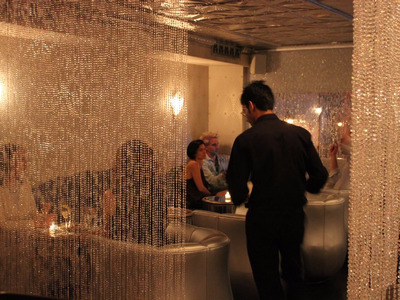 It can get crowded around happy hour, but its grand piano and chandeliers offer an elegant atmosphere. Lovers of Today makes all of its liquors in-house. To get to Lovers of Today, look for a gate marked 132 ½. Once you open the gate, you'll see soft-cushioned booths and dim alcoves that make it the perfect spot for a date night. Inside, you'll get liquors that are all made in-house and have fun names like Satellite of Love and Waterloo Sunset.